Haven't found out the gender? Don't know the nursery décor? 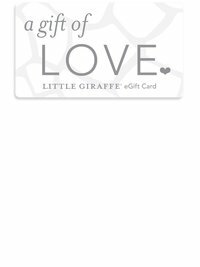 Give the gift of LOVE with a Little Giraffe eGiftCard! Simply choose the amount you'd like to give and we'll send the eGiftCard to your inbox so you can send it to the friend of your choice. Always the perfect gift for new parents or anyone with a taste for luxury and an eye for style. Everybody LOVES a shopping spree! Cards are only redeemable at LittleGiraffe.com and never expire. Please visit our FAQ section for full details.